(Newser) – It was only a matter of time—just a couple of months, actually—before a preteen boy captured in a viral video yodeling in a Walmart put out a record. 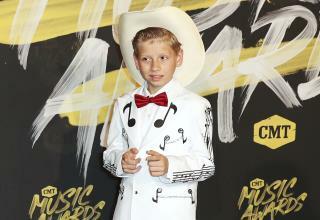 Mason Ramsey, the 11-year-old whose version of a Hank Williams classic has been watched more than 50 million times on YouTube (one version here) and spawned multiple remixes, will put out his first album on July 20, per the AP. Titled Famous, the EP includes a mix of new songs and country classics, including the song that made Mason an overnight internet sensation, "Lovesick Blues." Raised in the small town of Golconda, Ill., Mason says his grandfather taught him to sing when he was 3, and he started performing at nursing homes, restaurants, and fairs. But it took him weeks to discover that his impromptu Walmart performance had gone viral, because his family didn't have internet access at their home. They got a call from producers with The Ellen Show, and Mason was flown to Los Angeles—his first-ever plane ride—to be a guest on the show. He signed a record deal with Big Loud Records and Atlantic Records, and he's popped up at Coachella, Stagecoach, and the Grand Ole Opry. He'll be opening for Florida Georgia Line at their Las Vegas residency later this year. Mason's six-song EP includes covers of other Williams tunes, including "Jambalaya (On the Bayou)" and "I Saw the Light," as well as his own single, "Famous," which was co-written by Florida Georgia Line's Tyler Hubbard. Throughout all the excitement of the last few months, Mason says his main goal is to keep performing until he's an old man. "Fame is a good thing, but you have to use it in good ways," he says. "Family is more important than anything." This kid needs to pair up with the Mizzone brothers https://www.youtube.com/watch?v=GXcRI0BdioE or The Kempters brothers https://www.youtube.com/watch?v=eCAFfX_va_I Lots of good young talent here! Though this kid would do just fine solo, too! This kid is good! Just glad he took up singing Hank Williams Sr. and not Jr. Hank Sr. was good, Jr..... far, far from it. Hard to believe he fell from the same tree!